Have you ever wanted to give a little something extra as a gift? Here is a cute little bear that can be made in a short amount of time. Use a large-print fabric or use scraps of fabric from a quilt so that the bear matches! 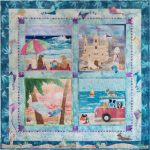 Take the plunge and learn to quilt using fast cutting and machine piecing techiniques. 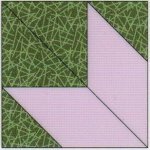 Lean basic cutting and piecing skills, along with how to add a border. This class will cover making the top only: complete the quilt in the "Finish It" class. Book and Supplies required. Get 10% off your required notions including rotary cutting mat, rotary cutter, ruler, thread, and needles. This large tote can hold it all - a big quilt, large tools, or your UFO in progress. With some pockets on the outside you are sure to be able to take advantage of this bag wherever you go. The name describes is all, it is big and it is easy to make. Don?t miss out! Perfect carry-on or overnight bag for all of your goodies. This intermediate project will give you a bag that holds all your favorite sewing items and much more! This colorful quilt is unique in that you have three different designs from which to choose. Your decision is made after sewing the top half and the bottom half! Instructions are included in the pattern on how to achieve these different designs. Tap into the creative power of your walking foot! Get acquainted with its features while learning about linear and matchstick quilting. Thought your walking foot could only be used for straight lines? We will quilt wavy lines, sectioned curves and spirals as you master quilting with your walking foot. Also, tips on how to maneuver a large quilt will be given. 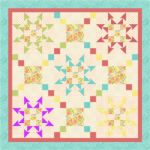 In this hands-on class, learn how to use the program tools to create your own quilt designs using EQ’s extensive libraries of blocks and fabrics. Have you ever wanted to make a Snail?s Trail quilt? If so, then this quilt?s for?you! Filigree is a unique variation on a traditional Snail?s Trail block. Instead of a four patch in the center, there are two pointy triangles giving you inter-locking twists - a unique effect reminding us of filigree scrollwork. With the addition of the Corner Beam units between the Snail?s Trail blocks you have even more spiky interest! Learn how to finish your first quilt. This class will cover the process of layering and basting, straight-line quilting, adding binding, attaching a label and a sleeve for hanging. Join me each month and discover the fun and freedom of free motion quilting! Here is a chance to gain confidence while having guidance in a relaxed environment. Do you have any McKenna Ryan quilts that need that special touch? Build your skills and have fun practicing while we work with designs and shapes with stencils and fillers. GIRL GANG & BEYOND A.K.A. ~ GIRLS JUST WANT TO HAVE FUN! Come by the shop to see the new project for this club. Lots of fun and friends make this a great way to spend an afternoon! GNO a.k.a. GIRLS NITE OUT!!! Enjoy a dedicated time to work on your own personal projects in a supportive environment. This is is a club for all those fans of Starch-turned applique (the p3 Designs Pearl Pereira method). Join in the fun of this club for all those fans of Starch-turned applique (the P3 Designs Pearl Pereira method). In this club we continuing to work on Pearl’s quilt “Octopuses Garden” or any other project that you would like. Marilyn will be leading the club for all levels - from those just starting to quilters that want to brush up on existing skills. From drawing, hand cutting the shapes, using the Cameo to cut, fabric turning methods and stitching, we will continually review it all as we work through the blocks of this quilt. This might be the most fun you have had piecing a quilt. A simpler version of the ?stack and whack? quilts, there are no hexagons involved, but you get to choose how each kaleidoscope block will look before you sew it together. Are you a fan of Lori Holt projects but cant seem to get everything done? Come to the Club, bring your machine and join us for all the fun! New members welcomed any time! A modern take on Margie’s Scrappy Folk Heart. Log cabin strips, narrow and wide, create an off-center block with the illusion of a curved seam. Make 12 blocks and you’ll have a one-of-a-kind heart! Choose fabrics that are bright and fun or make one that is more traditional. We will have kits to make one like mine. This class is taught by the Judy Niemeyer Certified Instructor and meets monthly at the shop. Join us for a fun weekend of sewing, food, fun and friendship. Work on your own project with lots of sharing of advice and great snacks!! Starts Friday evening with a potluck dinner and ends on Sunday. The leaders will contact attendees with potluck sign-ups and details for the weekend. There are only 8 spots, so first-come, first-served on sign-up day. A rainbow of colors bouncing off diamonds! Using 2?? strips this table runner is fun and quick to make. Refraction is a mixture of the Diamond Rectangle units and squares, making the simple look tricky. The?Diamond Rects?tool allows you to make the diamonds easily and precisely. You?ll have fun making this beautiful table runner and in no time it?ll be ready to use on your table. Here is a Bargello Quilt that can be done as a Quilt As You Go!!!! All you will need to do is add Borders and Binding when done. How easy is that?? This is a low-cost day to come to the shop and sew on a project of your choice. Whether you are working on an UFO or the monthly Saturday Sampler, Marilyn and Jerry are there to help you when you need it. We'd love to see you there! This is a great craft project carrier for all your quilt/craft goodies. It even has a hand center zippered divider! Easy outside pockets and handle make this a great project for you! Have you ever purchased a ruler and get it home and can?t remember how to use it? Or have you looked at a pattern and thought it was much too hard for you? Then this is just the class for you. This pattern looks much harder than it is and I will show you how to make it using the loc bloc ruler. By the time you finish these blocks you will have mastered the tool, plus you will have a beautiful quilt to show for it!. Do you have any UFOs you want to finish? In this session we will do a quick review of all the rulers we have shared so far including the Tucker Trimmer, Diamond Rects, V-Block, Split Rects, Wing Clipper, Large Square Squared, Corner Beam, Rapid Fire Lemoyne Star, Rapid Fire Advanced I and II. Adds twists & turns and unique options making odd shapes easy to piece. No Y-Seams making this stunning star using a strip-pieced method! 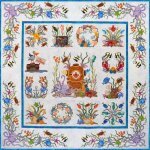 Dive in and enjoy making this charming quilt using min-charms, 5” charms squares, or a layer cake. Whatever you chose, this quilt is sure to make you smile!